Of all of the foods for which Louisiana is known, one of the oldest and most famous is, without question, gumbo. This thick, dark stew, containing vegetables (usually a celery, bell pepper, and onion mixture known as the “holy trinity”), meat or seafood, and served over rice, is as much a cultural symbol of the state and its people as is jazz and Cajun music. You will find gumbo in almost every restaurant, catering venue, and home throughout the state. Gumbo is generally thought to derive its name from the word kingomb, meaning okra in the West African dialect of Bantu, the homeland of many of the slaves brought to Louisiana. 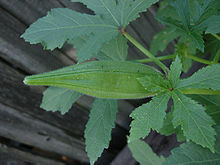 Since okra stews were one of the slaves’ staple foods, and the vegetable’s edible fruit and leaves often used as a thickening agent in making gumbo, it is reasonable to assume the dish bears some African heritage. On the other hand, since many gumbos are also thickened, colored, and flavored with roux, a French ingredient developed in the fourteenth century, there are those who feel that gumbo is a variation of French bouillabaisse. 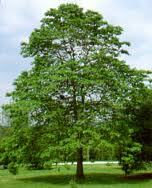 Still another theory is that gumbo originated with the Choctaw tribe of Native Americans because some gumbos were thickened by ground sassafras leaves (or filé) they called kombo. But while neither of these stories are widely held by historians as the origin of this famous regional dish, it seems certain that gumbo is not totally without their influences, as well as that of German and Spanish, too. Gumbo was first documented almost 300 years ago when twenty-four different kinds were served at a French gubernatorial reception in New Orleans. Some twenty years later, in Mary Randolph’s cookbook The Virginia Housewife, the first recipe for gumbo was published, although it bore little resemblance to the dish we know today. Then in 1879, a cookbook by Marion Cabell Tyree included a more familiar chicken and oyster gumbo recipe thickened with filé. Two years later, the cookbook What Mrs. Fisher Knows About Old Southern Cooking, written by former slave Abby Fisher, contained three gumbo recipes–two thickened with okra and an “Oyster Gumbo Soup” that used a filé base. Gumbo can be divided into two categories. The variety commonly served in New Orleans and southeastern Louisiana is known as “Creole” gumbo, after the French and Spanish descendants who settled in those areas. It most often contains seafood (some combination of oysters, shrimp, and crab), tomatoes, and is usually thickened with a light roux. It is generally not as spicy as the Cajun variety, and rarely contained celery until the mid-twentieth century. “Cajun” gumbo, more common to the southwestern part of the state and the descendants of Arcadia, is normally characterized by its very dark roux, cooked until just before burning. 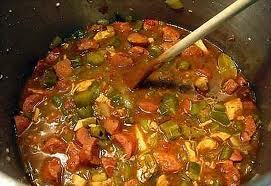 Most often Cajun gumbo was traditionally made with various foul or other meats and sausage. However, during the last century the addition of seafood to some recipes became popular. Cajun gumbo is almost always topped with chopped parsley or green onion just before serving. It should be noted that over the years the popularity of filé as a thickener has waned and both Creole and Cajun style gumbo now use a flour and fat roux, although the cooking time which determines flavor and texture varies. The darker a roux, the more nutty and rich its flavor, but the less thickening power it will have. Also, either style gumbo may use okra in conjunction with the roux. A third, meatless (and sometimes roux-less) style of gumbo known as “gumbo z’herbes” was often served during Lent. This type of gumbo incorporates turnip, mustard and/or collard greens, and spinach. With today’s more relaxed Lenten restrictions, this dish has become less popular. Today, most people are familiar with seafood gumbo and chicken and sausage gumbo. But truthfully, they just touch the surface of gumbo cookery. There are as many recipes for gumbo as there are gumbo cooks. Contemporary gumbos may include all manner of ingredients–duck, turkey, crab, shrimp, oysters, ham, smoked sausage, andouille, beef, venison, or squirrel. Some are roux-based; some with okra and some don’t. Some may add filé just before serving and some may not. Everyone has their own taste and opinion. Those readers wanting to sample a wide range of gumbos, prepared by some of Louisiana’s best cooks, should plan a trip to the World Championship Gumbo Cook Off held each October in New Iberia. Another great celebration worth attending is the annual Gumbo Festival held in the self-described “Gumbo Capital of the World,” Bridge City, Louisiana, which features gumbo cooked in a cast-iron pot three feet deep and five feet in diameter. But whether you attend one of these exciting events or just happen to be traveling through the state, you owe it to yourself to stop and enjoy a hot, steamy bowl of gumbo–the official cuisine of Louisiana. This entry was posted in Main Courses, Soups/Stews and tagged Cajun, choctaw tribe, Creole, festivals, food, ground sassafras, Louisiana, New Orleans, restaurants, shrimp, travel by grubamericana. Bookmark the permalink.